Note that there is nothing about being paid or not, or about working as part of any group or not; note also how these definitions read like a tailor-made summary of Habbabku’s behaviour on this blog. Yet also then oxymoronically state that “people should engage with the arguments made and not the motives”, yet Trolls by definition are Trolls exactly because they are driven by ulterior motives rather than by honest arguments! So perhaps you might want a little rethink about this obvious policy contradiction ! I’m sorry to have to also say to you that your Blog has an increasingly bad reputation amongst the Lefty online community, for being troll infested, for driving decent people away, and for the heavy censoring of any critics. Macky. you should engage Craig according to the term “troll” as he used it; as an advocate or propagandist. Trolling as you defined it (the usual definition and the one I accept) is already covered by Craig’s moderation rules “engage with issues, not commenters; play the ball not the man. Do not impute motive”. Deficiencies in enforcement of those rules are probably due to shortage of moderators, and moderators having lives beyond this blog. Haha – I really got Has. He hasn’t addressed any of the points I made. Hasbara – you’re not going to win on this blog – go away and all Hasbara. How much are you paid? Just go and accept you’ll never be accepted here. No, Craig doesn’t get to personally redefine a term for everybody else when it already has an accepted meaning, and especially when there is another existing correct term for what he apparently means, which is being a “Shill”. The Troll asked Craig if he thought he was in a Troll, in the unstated accepted meaning of the term. In fact if Craig means that he thinks that the Habba-Clown is not a Shill, but rather some old loner in a bedsit, sitting non-stop in front of his pc in his string vest, getting cheap thrills from being offensive, and suffering from narcissistic Walter Mitty type delusions about his very limited abilities, then he & I are in agreement. Funny how there are no such deficiencies apparently for the likes of Uphill/Ishmael, (moderated out of existence, & within minutes usually of posting any comment), or other serious criticising posts/Posters. Habba, you may well be a genocide denier. That is your choice. Let others decide. You are also a Jannerite abuse denier. Let the people decide. You might see Lembkin as a shrill self-hater. That is your choice. Let others decide. We hear assertions from you with ingenuousity of epic proportions. Epic trolling. The reason that the BDS boycott of the apartheid state is working is because the people refuse to be browbeaten by those who support the slow genocide in Gaza. Thanks, ahead of me there; I’m a great fan of Hugo Chavez (RIP). The info re the ‘particularly aggressive cancer’, and the guy who brought him his food, is very interesting indeed. The US started trying to produce a particularly aggressive cancer virus, in order to infect Castro: see ‘Me and Lee’ (Judyth Vary Baker) and ‘Dr. Mary’s Monkey’ (Edward T. Haslam). I have always gone along with Hugo’s suspicions about so many Left-Wing leaders of Latin American countries coming down with cancer. : see ‘Me and Lee’ (Judyth Vary Baker) and ‘Dr. Mary’s Monkey’ (Edward T. Haslam). You’re flogging a dead horse. Craig has said what he wanted to say about trolls and isn’t going to get into a sterile discussion with you on the subject. Apart from anything else, your guff is boring and trite. My suggestion : go onto Squonk and beef on about it there – as you have in the past. (Apologies to Squonk). Diverting again, this time in the form of a few lies about me? For someone who “doesn’t care” you are devoting an awful lot of your time to writing to and about me, aren’t you? Vy the way, I like the way you and others have shifted the emphasis; first it was just “genocide” (everywhere in Palestine and without an accompagnying adjective), then it was “genocide” in the West Bank and now it’s “genocide” in Gaza. I ca,’t remember at which stage of this reductive process the adjective “slow” crept in. Not that any of that matters, of course, because – inter alia in the terms of the 1951 UN Genocide Convention – Israel has not committed and is not committing genocide anywhere, quickly or slowly. 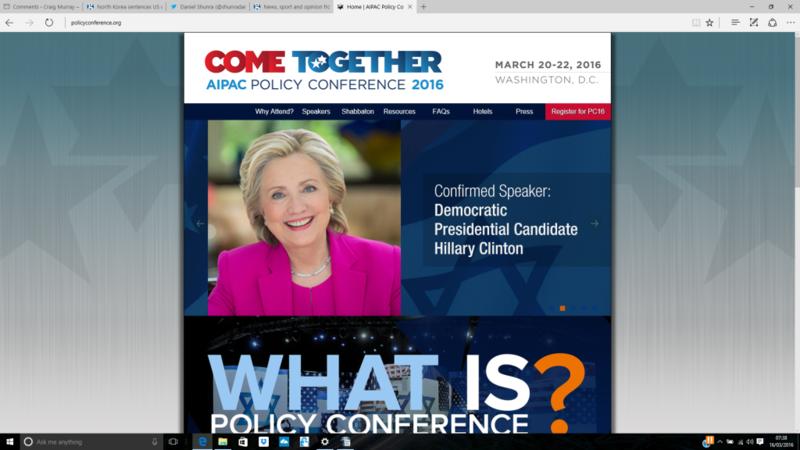 The title of the AIPAC gig,(attendance at which is compulsory for politicians seeking campaign funding) ‘Come Together’ is, I hope, not intended to imply some kind of linkage with the Beatles’ song of the same name. The Beatles were banned from Israel in 1965, and I am reasonably certain that its author, John (Give Peace A Chance) Lennon would not have supported the frequent and indiscriminate bombing of Gaza, or the steady Bantustaning of the Occupied West Bank. @Habba-Clown, very apt that you are so active on a thread titled “The Great Certainty”, as the great certainty to anybody with even an ounce of commonsense, is that you are an obnoxious Troll. I am active on a good many threads, as you have found out to your cost. 2009 marked the year an ongoing campaign was launched to have AIPAC return to its roots by re-registering as an agent of the Israeli Ministry of Foreign Affairs, rather than continue to operate as a domestic American lobby and “social welfare” organization. In 2010, AIPAC’s tax exempt status was also challenged. These concerns could have been sufficient to drive away scores of AIPAC’s key base of $5,000-plus donors. AIPAC’s signature Washington gathering in May 2011 had a Potemkin village feel to it. Many attendees interviewed by Max Blumenthal seemed woefully uninformed about the issues. Many hundreds of others, including student leaders, attended only after receiving heavy travel subsidies…. …Who are the two people now providing the lion’s share of AIPAC’s funding? As long-time Washington Report on Middle East Affairs editor Janet McMahon revealed during the May 2011 Move Over AIPAC conference, it’s not clear what percentage of AIPAC’s donations come from American contributors and sources. Questions as far as I know still unanswered. It is noticeable that Obama has asked his party to rally around HRC rather than Sanders. Sanders has not been invited to speak by AIPAC. The BDS boycott is obviously having an effect and the genocide will be halted, eventually. “Sanders has not been invited to speak by AIPAC. Not really. 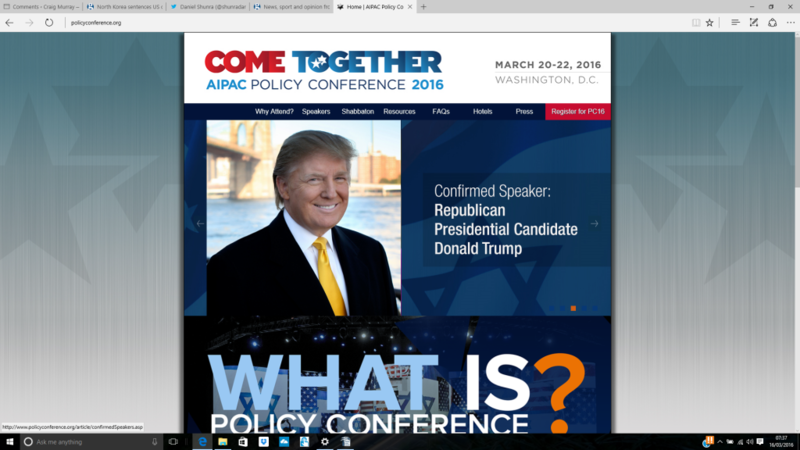 AIPAC knows he hasn’t got a chance of winning the nomination, so why waste its time inviting him? Yeh, maybe your right, Habs! Perhaps not, but it helps enormously in exposing the War Criminals and morally repugnant system that runs Israel. That’s very interesting because it seems to imply that some people (not you, of course! )are more interested in “exposing” sundry Israelis than in helping the Palestinians. It’s pretty obvious that over the past 2-3 decades, both the US and UK political establishments increasingly have deemed unquestioning, uncritical allegiance to the Zionist lobby as a pre-requisite for avoiding political destruction. It is shameful. The actions of the Zionist lobby is shameful. Israel’s policies towards the people of the West Bank and Gaza are shameful. Other lobbies are there and always have been, but that does not alter this toxic dynamic, which most certainly has become ever-stronger, so that now effectively represents a stranglehold over the US/UK political class. It is the major barrier to achieving a Peace Deal wrt Palestine-Israel. The Ruins of Gaza. Post Traumatic Stress Disorder (PTSD) in a study published in the Arab Journal of Psychology found that 92 percent of Gaza Palestinians between the ages of 13 and 18 showed symptoms of the disorder. I’m sure that exposing the evil leaders and system that oppresses the Palestinians will be of assistance to them, as people in the West will become more sick of the sycophantic kowtowing of their governments to the Zionist lobby. As you didn’t mention it, can we take it you agree that ‘Israel is run by War Criminals and a morally repugnant system’? If this is what Trump did with three hoods to back him, it doesn’t bear thinking about what he would get up to with the US Military and Security Services at his disposal. Funnily enough, after seeing the anger from our resident troll in recent days I think you could substitute a name or two. Fortunately, I don’t have to bow when he clicks his heels (much as he would love it). Instead, my reply to the purveyors of genocide denial is to remind them that Palestine will be free one day. The BDS campaign is but one step we should all support. Genocide denial with such a “nifty tool” of “intent”. Evidently all those hundreds of thousands of Palestinian dead, and ethnically cleansed millions of Palestinians were just results of careless accidents, and none of these were the intended outcomes! When a zionist invigilate scum in uniform aims and fires it is an accident that the bullet kills the Palestinians and obviously the bullets fault and has nothing to do with the zionist supremacist scum bag that fired it. IDS and Habba are both genocide deniers. There is hope. My personal opinion is that IDS has seen that genocide denial is no longer sustainable. He has realised that the BDS boycott is having an effect. Before I get to your “magisterial and definitive” post on genocide, I’d just like to address your misunderstanding of the notion of “ethnic cleansing”. You are correct that “ethnic cleansing means getting rid of the target group or nationality from what you consider your territory, doesn’t it. Either by expulsion or by simply killing”. However, your suggestion that “a target group which has been ethnically cleansed is likely to be smaller than just before it has been ethnically cleansed” is erroneous, because the term applies to the land, not the people. Don’t be embarrassed by the syntax error, English isn’t my native language either. The Palestinians have not been ethnically cleansed; their land has been. Large swathes of what was Palestine are now reserved for Jews only (apartheid, btw), the land having been “cleansed” of non-Jews, and Palestinian presence reduced to zero. Israel’s expropriation of Palestinian territory is almost the archetype of ethnic cleansing; murderous force and terror displacing many of the indigenous occupants, followed by spurious legal justification for the oppression of the remainder. I mean really; on what rational basis can one deny that Hebron has been ethnically cleansed? Only if the term has no meaning at all. For your information, there is prima facie evidence that Israel is guilty of at least four of the five criteria listed. Given how Israel has treated the Palestinians over the past 30 years that’s an extremely arguable proposition. So more properly, one could state that Israel is guilty of politicide , and is also suspected of intent to genocide. Because one the lessons of the Holocaust (and I am embarrassed to be having to explain this to a Jew) was that when a nation’s politicians expressed murderous or expulsionary intent towards minorities, these warnings should be taken seriously, lest they end in annihilation for all. Finally, let’s look at your response to merkinScot’s comment that “The BDS boycott is obviously having an effect..” Which was “I’ll huff, and I’ll puff, and I’ll blow your house down…! I think if you refer to the speeches of the war-criminal Nentenyahu, you’ll find that heads of the Zionist crime family understand exactly what they’re up against; an existential threat. So cry all you want; the tide of history is against you. It also makes clear that the new push is, in part, the work of Mossad, Israel’s overseas spy agency.